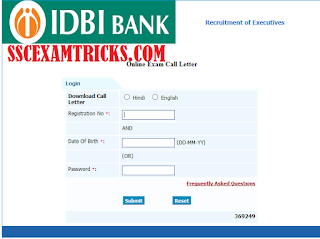 IDBI Executive Admit Cards 2015 Released – Download IDBI Executive 2015 Call Letter Hall Tickets – idbi.com. 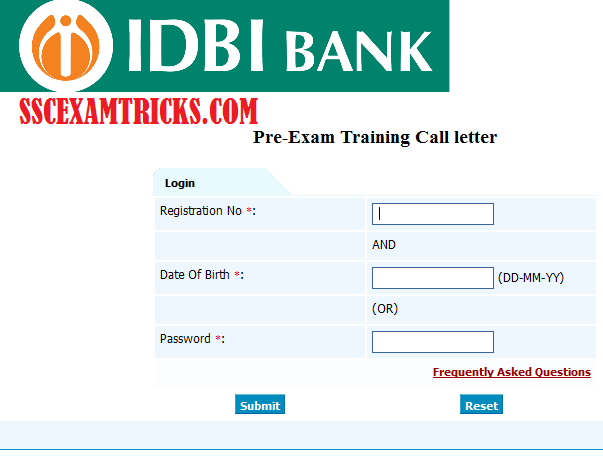 The latest news is that IDBI Bank has released Pre-training exam online admit cards on official website for online written examination which is going to be held on 11th July 2015 at various centres i.e. Ahmedabad, Bhopal, Bengaluru, Bhubaneswar, Coimbattore, Chennai, Chandigarh, Guwahati, Hubli, Hyderabad, Jaipur, Kanpur, Kolkata, Kochi, Madurai, Mangalore, Mumbai, Nagpur, New Delhi, Patna, Pune, Raipur, Rajkot, Ranchi, Vijaywada and Vishakhapatnam for recruitment of 500 executives posts in various departments in the bank. The IDBI BankAdmit card 2015 for Executive posts has released on 30th June 2015 on official website. IDBI had invited online applications from 06th May 2015 to 22nd May 2015 against advertisement no. 2/2015-16 for eligible candidates for a total of 500 posts of Executives in all over India. The last date for payment of application fee was 22nd May 2015. Candidates must note down date of Pre-Examination training for the SC/ ST / OBC applicants at all centers will be held from 5th July 2015 to 10th July 2015. The Final Selection of the candidate will be based on the performance in online written test and personal interview of the shortlisted candidates. A huge numbers of candidates had applied for these posts and waiting for online IDBI Executive Admit card 2015. Candidates can download their IDBI Executive Admit card 2015 from the direct link given here. 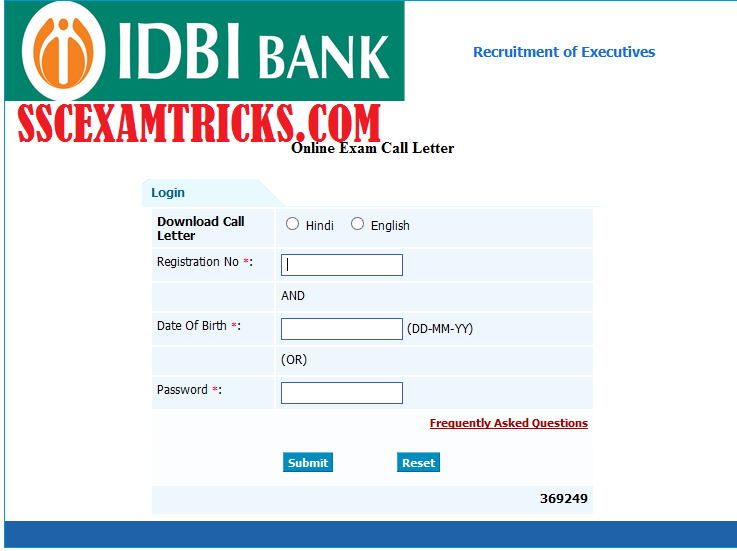 IDBI Executive Admit Cards 2015 Released: Read the instruction provided at the bottom of the admit card. Admit card is an entry card to appear in examination. It is a mandatory document valid with photo identity proof specially Voter Card ID, PAN Card ID. Ration card and Adhar Card are not considered as photo identity proof to check the candidature of any candidate. Candidates are advised that they don’t forget to bring their admit card along with photo identity proof to the examination centres. It is also advised to the candidates that they will reach to the venue of examination 20-30 minutes before the examination time. Late coming candidates will also be not allowed to appear in the examination hall. · It is mandatory to produce IDBI admit card 2015 (downloaded by website and printed Hard copy affixed with Colored passport size photograph) before getting entry into the examination hall. · No candidate will be permitted to appear in the examination without IDBI admit card 2015. · IDBI 2015 Admit card will be checked along with valid photo identity proof of the candidates at the venue of written examination by duty officers. IDBI Bank 2015 DO and DON’TS BEFORE LEAVING FOR VENUE: It is advised to the candidates to reach the venue at least 30 minutes before the time of reporting. This recommendation is provided to relax your mind from expedition of route and prepare for exam for performing well. Don’t forget to bring computer generated Admit Card affixed with a coloured photograph, An Original ID Proof and Photocopy of the same ID proof which take to the venue of exam. In any confusion/dilemma/Illusion don’t hesitate to ask to the officers who are designated there for the help of candidate to reach to the exam room. IDBI Bank Written Test 2015 Exam Syllabus, Exam Pattern & Final Selection: The IDBI Bank Exam will be conducted on 11th July 2015 by ONLINE Mode. In ONLINE Mode, the exam will be entertained through filling of circles on Computer Generated Page containing information of answers which will be selected by filling circle in it. There will be NO OMR sheet to be filled by Blue/Black ball point pen. Rough blank sheet will issued for calculations/rough work in exam. The exam will be conducted an objective multiple choice question paper to be done within with in fixed period of time. The exam will be consisted of five sections contains questions of English (50 marks), Reasoning (50 marks), Quantitative Aptitude (50 marks).The exam was a multiple choice question paper of 150 questions of 150 marks in which four options will be provided out of which candidates need to choose one correct answer. There will be a 1/4th negative marking for each wrong answer. Candidates can download tips-tricks & General Awareness questions answers sets for WBJEEB JELET Entrance Exam 2015 which are prepared from most popular books specially for the candidates to achieve cut off marks for getting qualified for IDBI Executive Exam 2015. Tips are prepared with smart work to qualify IDBI Executive Exam 2015 in first attempt. IBDI Bank 2015 Personal Interview: The List of Shortlisted candidates called for interview based on cut off marks will be released on the official website. Candidates will be scored equal to or greater than the cut off marks to qualify for interview round. The cut off Marks Result will be released category wise along with name, father name, roll number, date and venue of interview. The qualified candidates will be called for personal interview of the candidates. The personal interview will be conducted with original document verification of the candidates at the venue of personal interview.